Pupils in Years 1 to 6 are taught by their class teachers for the core subjects of Maths, English, Science and Computing. Each class benefits from a dedicated Teaching Assistant and maximum class sizes are 25. Our curriculum is further extended to include a wide range of subjects including, History, Geography, Art and Design and Design and Technology. Pupils in the Prep School also benefit from access to Science and Design and Technology laboratories which further enhance the teaching and learning. As in our Pre Prep Department, Music, PE and Languages are taught by specialist subject teachers in dedicated classrooms. By the end of Year Six all of our pupils are well prepared both academically and socially for the excitement and new challenges of senior school. Specialist teaching of Music and PE begins from Nursery and is open to all pupils as part of our broad and balanced curriculum. We are fortunate to enjoy fantastic music and sports facilities at the RGS, as well as plenty of large, open spaces in which to practice and perform. We have dedicated Music Rooms, an Art Room, a Sports Hall, a large all weather sports pitch, athletics track, undercover basketball courts and an impressive 5 lane, 25 metre outdoor swimming pool. The sound of music can be heard throughout the School and plays an important part in school life. All of our pupils receive specialist music tuition and we offer a range of practical and theoretical music lessons. There are opportunities to study various instruments and all pupils from Year 3 receive an instrument provided by the School. 1:1 tuition is also available. Prep School pupils enjoy creative art lessons in our dedicated art room and their handiwork can be seen adorning the school walls and noticeboards. Displaying and celebrating our pupils’ work is essential for building confidence and developing a sense of pride and competition. Languages are taught from Nursery onwards by specialist teachers. This begins with an introduction to their chosen language in Pre-Prep before lessons become more formalized in the Prep and Senior School. In accordance with the Ministry of Education in Qatar, all Qatari pupils receive Arabic language lessons with a specialist Arabic teacher. All other pupils can choose between Arabic or French language lessons. Islamic Studies is available to our Muslim pupils from Year 1 and all pupils are taught the History of Qatar from Year 3. We can offer limited support to children who require a small helping hand with either their English language or subject skills. 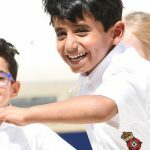 The language of instruction at The RGS Guildford in Qatar is English and so it is essential that all children have a basic working knowledge of the English language prior to enrolment. We do however provide support to pupils whose first language is not English and we have excellent relationships with a number of high quality English schools in Qatar that we are happy to recommend. The RGS Guildford in Qatar aims to support all pupils enrolled at the school to progress and achieve their full potential. We employ a Special Education Needs Coordinator (SENCo) who oversees this department, however, at this time the school has limited resources to support pupils with SEND. Upon application to the school we ask that parents disclose all past and present information relating to SEND. Upon reviewing this information and subject to pupils satisfying the School’s selection criteria, a place at the school might be offered, if the school possess the facilities and expertise to meet their needs. Failure to disclose all information relating to SEND might result in pupils being asked to leave the school after enrolment.